Krawiec posted his third national event win of 2009 Sunday in the final of the 30th annual Mopar Mile-High Nationals at Bandimere Speedway. Advancing to his sixth consecutive final round, Krawiec booked an automatic win when Andrew Hines – Eddie’s fellow Screamin’ Eagle Vance & Hines Harley-Davidson teammate – red-lighted at the start by 0.008-second. Krawiec, meanwhile, covered the quarter-mile in 7.450-seconds at 175.62 mph. For the record, Krawiec became only the second National Hot Rod Association competitor and first since Top Fueler Rob Bruins in 1979 to secure a championship without winning at least one race. Sunday, Krawiec exited Morrison, Colo., with another “Wally;” an 88-point lead (739-651) over Hines and a mid-season infusion of confidence. Recall that Krawiec claimed the championship after qualifying seventh on the 10-rider Countdown ladder. “I think the biggest difference on our team part (compared to 2008) is myself,” said Krawiec, who has logged an imposing three wins and three runnerup finishes in the season’s first eight Pro Stock Bike races. “Rider confidence is the No. 1 thing in any category, whether it be driver confidence going into race-day, let alone going into qualifying. You need to treat every single pass down that quarter-mile as your final-round task. You want to make it the best run possible, and go to the other end and get the best qualifying position to go into race-day. Krawiec and Hines, the three-time Full Throttle Drag Racing Series champion, hooked up in the final for the second consecutive event. Hines had been spot-on all day at the Christmas tree, using an 0.022 light during a first-round win over Jim Underdahl’s Suzuki. Hines, the No. 2 qualifier, then nailed lights of 0.000 and 0.004 in respective wins over the Suzukis of Matt Smith and Craig Treble. “We didn’t have the best bikes every single round, but Andrew and I did our jobs as riders and got it done,” said Krawiec, a 32-year-old resident of Englishtown, N.J. “I’ve been to six straight finals, which is something I’ve never dreamed of. To have two straight all-Harley finals is incredible, and I’m just so happy for our team. Krawiec struggled during time trials in the thin air to qualify fourth, in an event that saw the top four qualifiers advance to the semifinals. But crew chief Matt Hines, a four-time winner of this event as a rider, kept tuning on Krawiec’s V-Rod. During eliminations, Krawiec disposed of Mike Berry via a hole shot in the first round with numbers of 7.373-seconds at 179.71 mph. Berry’s Buell clocked in at 7.488-seconds and 171.93 mph. Incredibly, Krawiec’s next three opponents – Douglas Horne; No. 1 qualifier Hector Arana and Hines – all fouled at the Christmas tree. Krawiec ran 7.388-seconds at 178.02 mph in the quarterfinals; 7.341-seconds at 180.33 mph in the semis and 7.450/175.62 in the final. 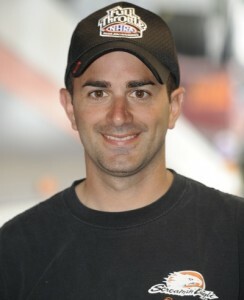 “I’m really confident,” said Krawiec, who made his NHRA debut at Englishtown in 2004. “I’m looking forward to actually getting out there and getting on my motorcycle and going into race- day. “You know, for the way that it turned out last year, I was ecstatic. I wouldn’t change a thing. I think that’s something that’s going to be etched in the history books for a really long time, and honestly, I don’t know if it will ever be broken again. But to go out there and capture some wins, and I’ve been in six straight final rounds, I just hope this momentum carries and I can do it in the second half of the season just like I did (in 2008). I’ve had a total of the last 13 races entered, I’ve been in 10 finals. So that’s pretty good statistics…75 percent of that has been final-round appearances for me. Krawiec started racing in the AMA Prostar Series in 1999. He finished a career-best second in the Prostar standings twice (2002-03) while compiling nine wins in 23 career final rounds. “I’m not really doing anything different; I’m just riding the bike with confidence,” said Krawiec, who competed in five NHRA events in 2005, highlighted by the prestigious U.S. Nationals. “You know, Matt Hines has given me an awesome motorcycle. A lot of people out there always compliment their crew chiefs, but if you look at what Matt is doing, he is tuning two bikes and that adds extra pressure on you come race-day. A winless Krawiec earned an appearance in the NHRA’s inaugural Countdown to 4 in 2007 and finished seventh in the final standings. His new-found winning prowess, Krawiec said, will not affect his approach to racing under the revised Countdown format. “My approach is before I even leave our shop in Brownsburg, (Ind. ), I plan on winning the race,” Krawiec said. “I go to every race with the intention of winning, just like every driver out there. You don’t dream of losing in the final, you dream of winning. That’s my approach and that’s the way that I go into every single race. “My main goal is, for the Countdown, it’s a little different this year. See, I’m going into it as of right now, I am the No. 1 guy, and the way I looked at it last year was I was No. 7. I didn’t have anything really to lose. I had everything to gain. And when you are the points-leader, you have everything to lose, but what you have to gain is you’ve got to maintain your position. Antron Brown (Top Fuel), Ron Capps (Funny Car) and Allen Johnson (Pro Stock) joined Krawiec as winners at Bandimere. The Full Throttle schedule for Top Fuel, Funny Car and Pro Stock teams continues next weekend with the second stop on the three-race “Western Swing,” the 22nd annual NHRA Northwest Nationals, July 17-19 at Pacific Raceways in Kent, Wash., near Seattle. Pro Stock Bike will rejoin the tour at the 22nd annual Fram Autolite NHRA Nationals at Infineon Raceway in Sonoma, Calif., July 24-26. With two months of racing remaining before the Countdown playoffs, Krawiec indicated his points position will allow the Vance & Hines crew to ratchet-up the meticulous preparation that leads to (repeat) championships.